Lorena King Fairbank, who was a member of the ACA and AAUW for more than 60 years, graduated from the University of Chicago in 1899. She was a member of the delegation led by ACA founder Marion Talbot to the annual meeting in St. Louis in 1904. Fairbank joined ACA at that event. She became involved in the suffrage movement when the Dakota Territory became two states and the new constitution denied women the right to vote. 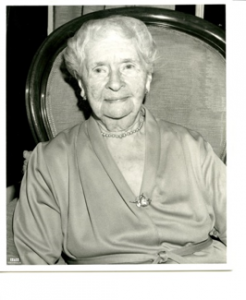 She established the South Dakota Division of AAUW and also several branches in the state. She moved to the nation’s capital in 1944 and continued her membership in the Washington, D.C., branch.